In March’s Ecology Club meeting, the fourth and fifth graders accomplished much in only one hour. First they harvested three planters of collard greens that were going to seed, and cleared all the decaying plant parts to the compost pile. Then they washed up and divided their harvest into bags they delivered to more than a dozen teachers of their choosing. Meanwhile, some cooked up a batch of greens for tasting, while others made hand-written copies of the recipe to attach to the teachers’ collard greens bundles. The students paired off to efficiently harvest more than a dozen collard green plants Ms. Little’s 2nd/3rd grade Ecology group had planted in Chesnut Garden. One partner snipped away, while the other made trips to the compost pile with decaying leaves. The students were so content performing this task that they started up a cheery work song — the theme song to the “Little Einsteins” children’s show. No one felt too old or too cool to join in. They were like happy worker bees. And they were very pleased with the outcome of their efforts – they filled up one tall yard waste paper bag! Smaller collard green leaves taste more tender and sweeter than bigger/older leaves. We remove all decaying material from our garden because it attracts decomposers who might eat our new plantings. Collard green flowers look and taste like broccoli because the plants are related, as they are to all cruciferous vegetables, including brussel sprouts, cauliflower, cabbage, kale and bok choi. Dark leafy greens are a rich source of calcium, in place of dairy. 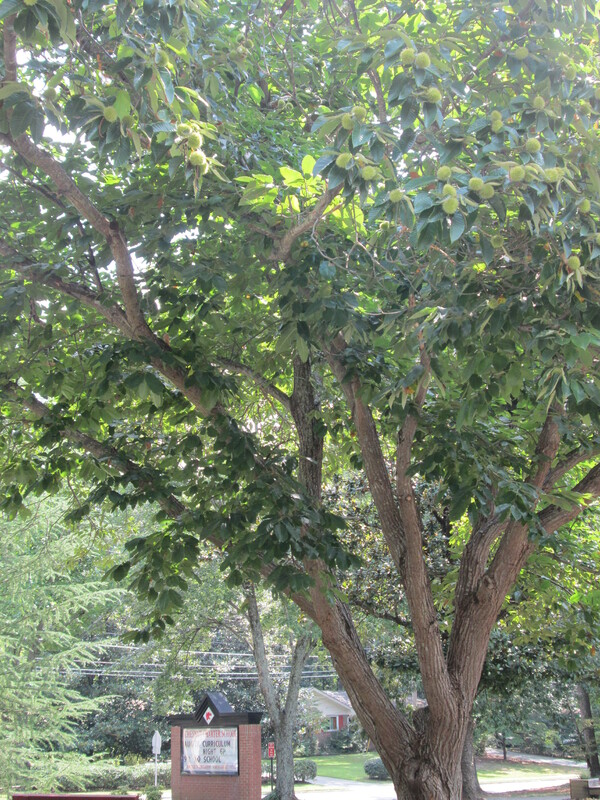 Perennial edibles that don’t have to be reseeded every year in Georgia include: herbs like rosemary, sage, oregano, thyme, mint; fruit trees, berry brambles, grape vines and asparagus. Coconut Greens Gift Bags – Chesnut Changer Approved! The students were proud of their bounty, and so, as soon as all hands were scrubbed, Ms. Sule organized the distribution of greens. Ms. Renals’ favorite part was the students’ excitement at choosing the recipients: “Can we give a bag of greens to Ms. Q? !” They loved making personal deliveries, and in one case, Mya Burrowes left a note in her teacher’s mailbox, telling her where to find her stashed bag of greens in the teachers’ lounge. They were like garden elves, and they loved the giving. They made more than a dozen bundles, attaching a “Coconut Collard Greens” recipe to each one. Meanwhile, Sofia Renals and Madison Hummel worked together to cook up a small batch of Coconut Collards for tasting. Students and teachers alike came back for more, and the kids were impressed at how delicious something so healthy could be. Chop greens into 2″ squares. Heat coconut oil in skillet on medium heat. Toss greens in skillet for 5 to 10 minutes. Salt to taste and enjoy! 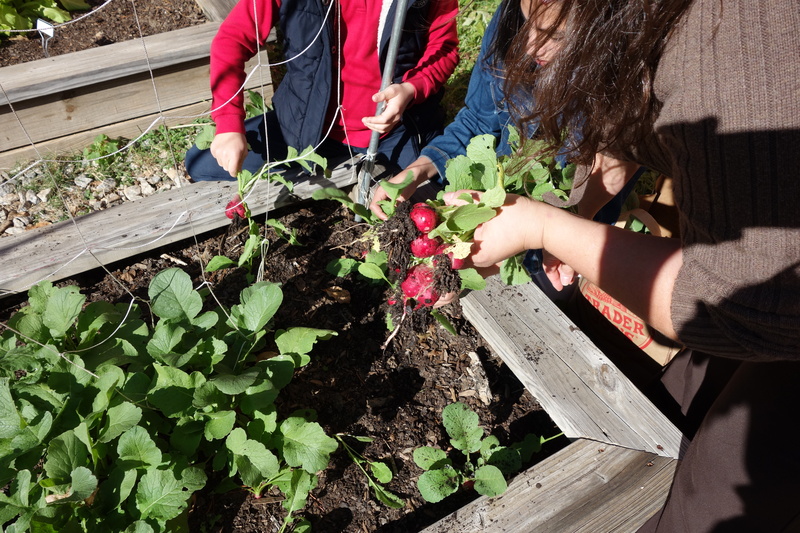 Ms. Sadler’s fourth and fifth grade students harvested so many radishes this November, Garden Leader Carissa Malone suggested they pickle some of them! 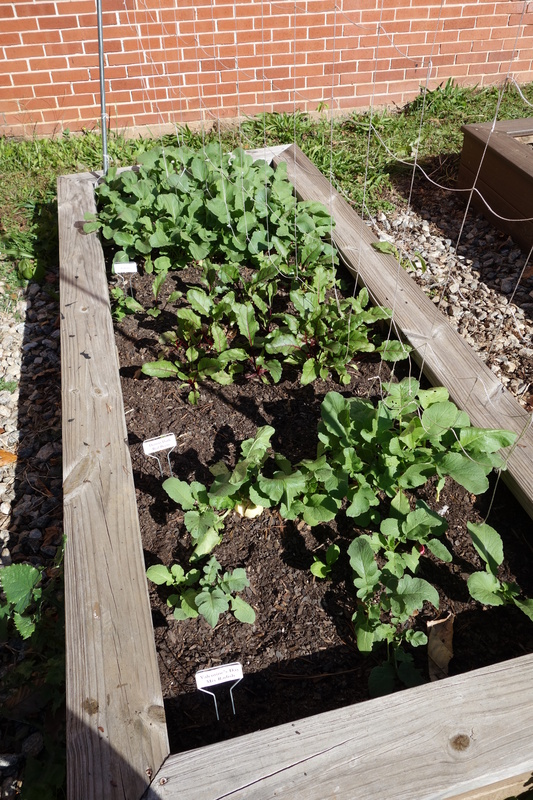 After gathering their harvest, students also planted a new bunch of radishes, which take about a month to grow. Right before winter break, Chesnut students arriving at the gym for P.E. were greeted by members of Chesnut’s Wellness Team. Coach Lonny Dykema, alongside PTC Wellness Team parents Jo Chin, Angela Renals and Jessica Spencer, launched Chesnut’s second series of Farm to School nutrition lessons. After reviewing how this lesson — “Tasting a Rainbow of Plants” — had gone the previous year, the group had altered some of the activities to increase student participation and applied learning opportunities. Make suggestions as to how to add color to their plates. 1. 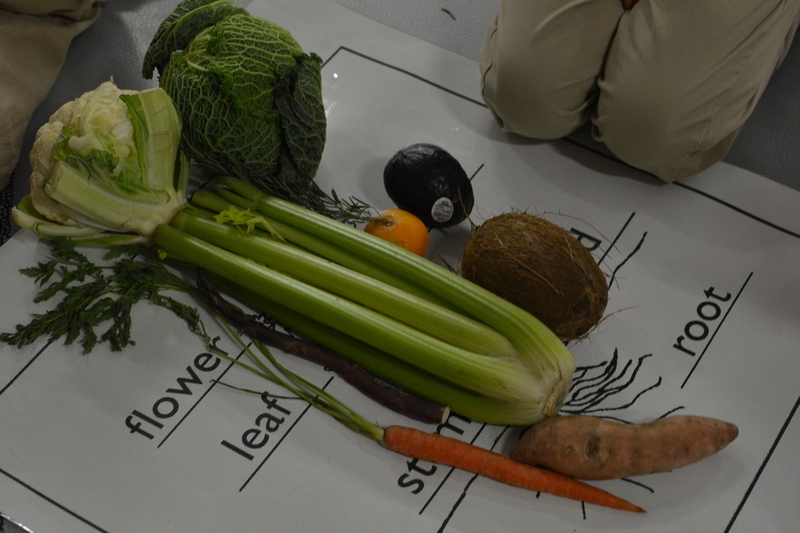 “What’s in Your Grocery Bag?” – Plant Part Identification Game: Students split into groups, each with a poster depicting the 6 plant parts (root, stem, leaf, flower, fruit, seed) and a grocery bag with a variety of fresh produce that the children were to place in the correct places on their posters. The kids dove in, passed their bags around, and largely correctly labeled their items. The challenges were at times the coconut (seed), garbanzo bean (seed) and asparagus (stem AND flower). 2. 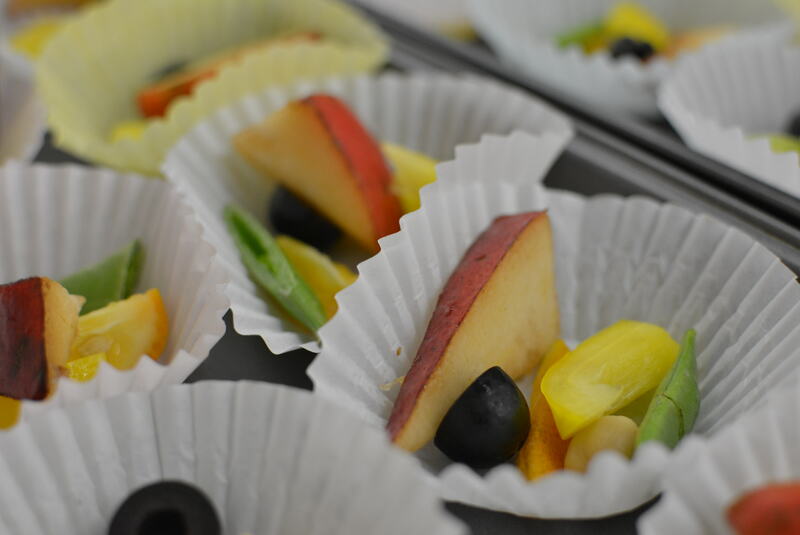 “Tasting a Rainbow:” Students each received a mini rainbow to sample: one snap pea (green), olive (blue/purple), chickpea (white/tan), bell pepper (yellow), pear slice (red) and kumquat (orange). We hunted for each by color, tasted, then challenged the students to name the food. Just as the slightly exotic pomegranate was a favorite last year (and requested again this year), the unknown kumquat met with rave reviews this year. Part of the fun in these lessons is encouraging the kids to be open to trying new foods and to developing a taste for them. We also discuss why we left the skin on their pears, and why we eat the kumquat’s peel: because the color (in the skin) tells us where many of the nutrients are. 3. “Turn This Plate from Simple to Super:” Slides depicted various typical kids’ meals (bowl of cereal, mac n cheese, cheese pizza, hamburger and fries, school lunch with chicken fingers and fries) alongside a rainbow of whole fruits and vegetables. We asked the kids to suggest how they could add more color to their meal with colorful whole foods. We had so many hands in the air with suggestions, we had to take 3 or 4 for each meal. 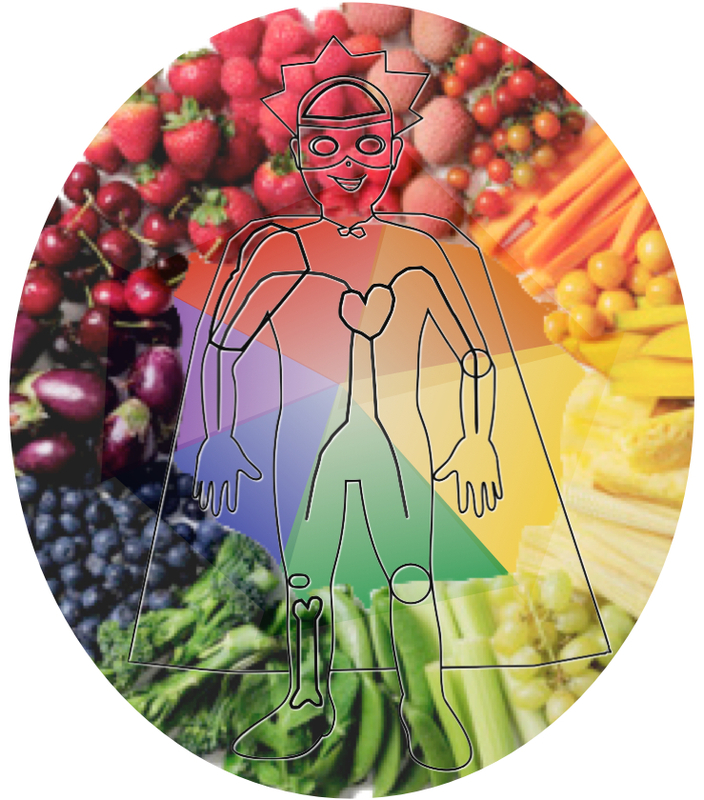 When items like ketchup, Fruit Loops or pepperoni were suggested, we had an opportunity to compare colorful whole foods to colorful processed, or changed foods, and think about which gives our body more fuel (“super powers”). Nope, that is not a typo. 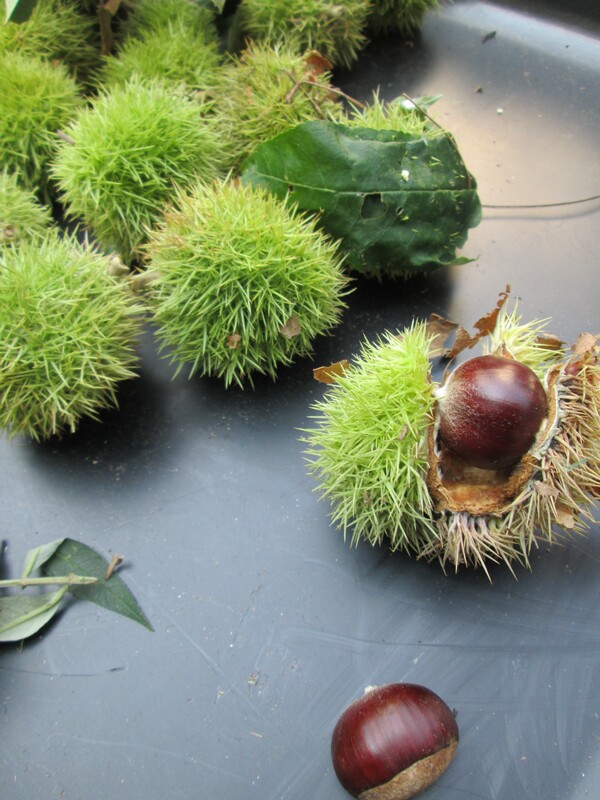 Urban gleaning is making a comeback, and Chesnut’s Ecology Club is joining the movement. Traditionally, gleaning meant foraging for leftover crop after the farmer had already commercially harvested it. 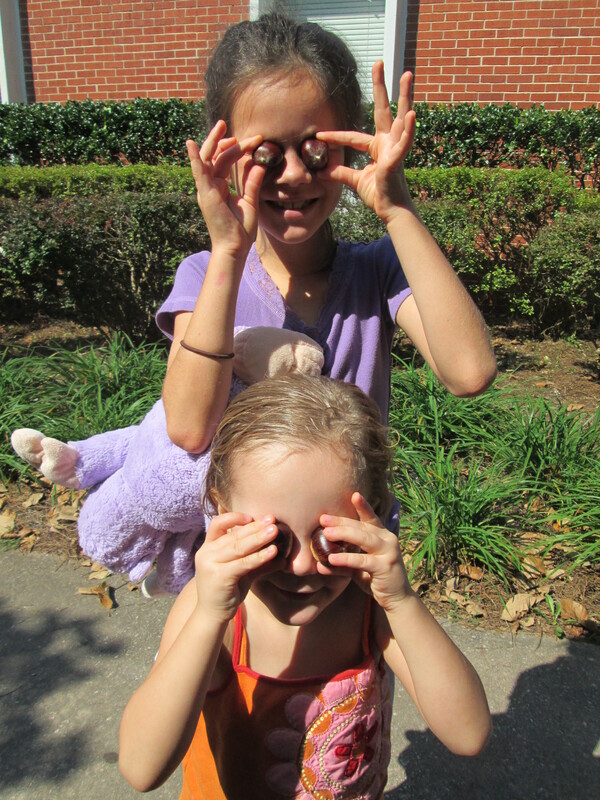 In this case, we are making sure the bounty on Chesnut Charter Elementary School’s front lawn does not go to waste. Last weekend at Clean & Beautiful, Ecology Club families scoured the ground underneath the school’s front lawn chestnut tree, collecting about 50 unopened burrs and fallen chestnuts. The children worked together, using bbq tongs and heavy duty gloves. Chesnut Changer parent and Boy Scout leader Kevin Trammell took the bounty for roasting at an upcoming camping trip. At $5 a pound or more, these nuts are fallen treasure! They are also amazing sources of Vitamin C, providing more than 70% of the daily recommended amount in one cup. When Ecology Club meets next Thursday, we’ll continue gathering these nutritious seeds. Stay tuned for details on a plan in the works to host a tasting, and donate extras to our neighborhood food pantry. On the last day of school in May, all of the Kindergarteners came out to the garden and brought along with them the sweet potatoes that have been sprouting in their classrooms. Garden Leader Carissa Malone had prepared two beds for this planting by clearing out the remaining carrots and English peas. While the students tasted the English peas, Ms. Malone showed them how to plant the sweet potatoes: break off the slip, tuck it into the soil, being sure to leave the tops of the leaves above ground. As the Kindergarten teachers returned to school, their arms were full of freshly harvested garlic, carrots, lettuce and strawberries to share with the other teachers. It was a fun last hurrah to finish a plentiful year in the garden. The Wellness Team especially thanks the Kindergarten faculty for fully embracing Chesnut Garden as a teaching tool, giving our children the opportunity to learn by touch and taste. As these children rise through Chesnut, we hope they will enjoy increased involvement and ownership in Chesnut’s growing Farm to School program. The Kindergarteners’ patience was rewarded this spring when they harvested the carrots they had planted 5 months earlier. The tiny ball-shaped ones (Tonda di Parigi variety) turned out to the be the sweetest, but the children also marveled at the purple, white and yellow carrots. Each carrot surfaced to a chorus of “oooohs” and “ahhhhs” — so great to hear! As always the students begged for seconds while Ecology Club teacher sponsor Mr. Chicoine chopped carrots as quickly as he could to keep up with the demand! Perched on the tree stump seating, they finished their garden time with a lesson from Ecology Club teacher sponsor Ms. Hobgood about the newest garden tenants: mushroom logs! Last year when Chesnut’s Ecology Club was formed, we ended the year with a grand finish: winning a grant to fund a farmer’s stand and chef demo during Field Day. Where once cotton candy had been served, now the children were snacking on freshly baked pizzas with Chesnut Garden’s herbs and local, organically grown arugula, onions and strawberries. One of the questions often asked in a grant application is how your organization plans to sustain the new program or facility. Turns out that the parents, teachers, students and staff so enjoyed this new healthy, fresh snack, that PTA added a line item for it as they planned this year’s budget. Special thanks to PTA President Ann Laffoon and PTA Vice President of Ways and Means Elizabeth Davis for supporting healthy eating at Chesnut. 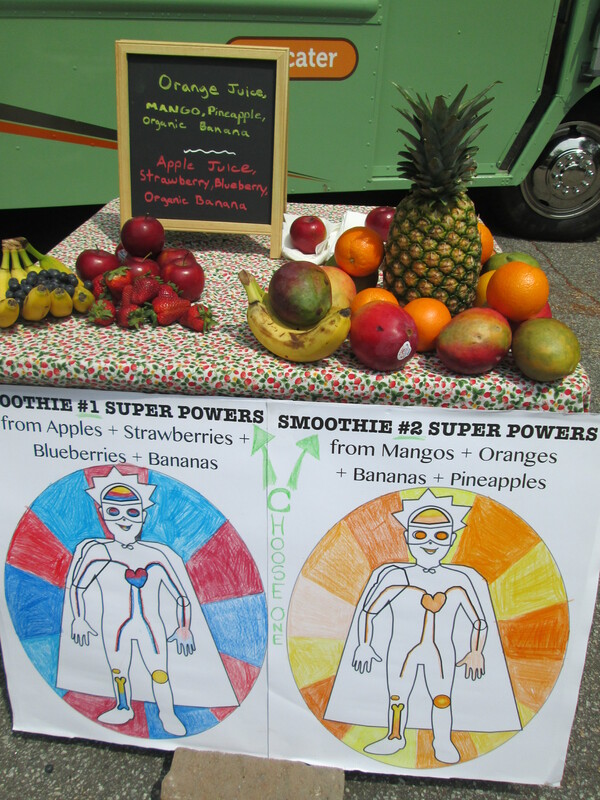 Beyond Field Day food, these parents also made Chesnut’s Wellness Team an official entity last summer, which gave parents and teachers a platform to introduce new health, nutrition and fitness initiatives this year. 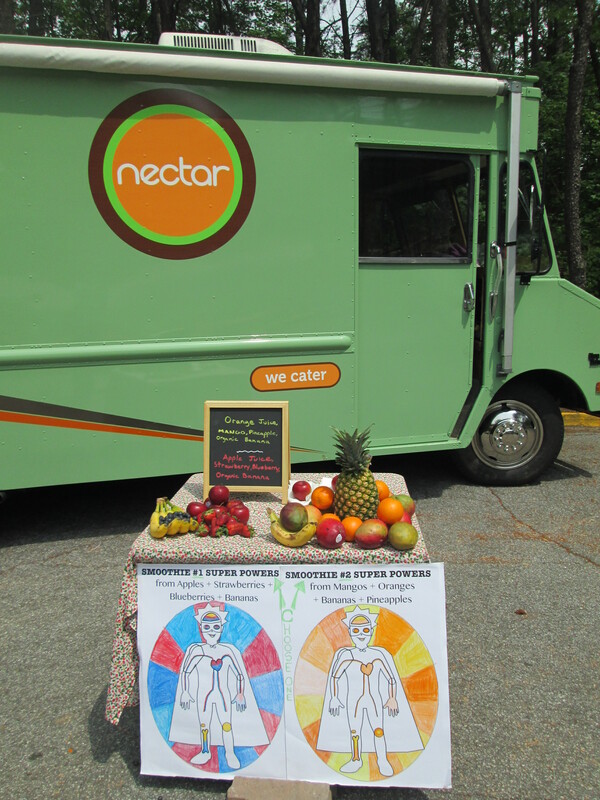 Having Decatur’s Nectar food truck serve fresh fruit smoothies at Field Day perfectly culminated our year. After appearing in our new spring and fall Farm to School nutrition lessons, “Tasting a Rainbow of Plants” and “Eat Real First, Second Read Labels,” Super Kid returned to remind our students of the health benefits of eating fresh, multi-colored fruit. Students, teachers, staff and parents chose between an orange smoothie (with banana, mango, pineapple and orange) and a red smoothie (with strawberry, blueberry, banana and apple). If we have smoothies again next year, we will definitely plan a larger quantity to make sure everyone gets their fill. 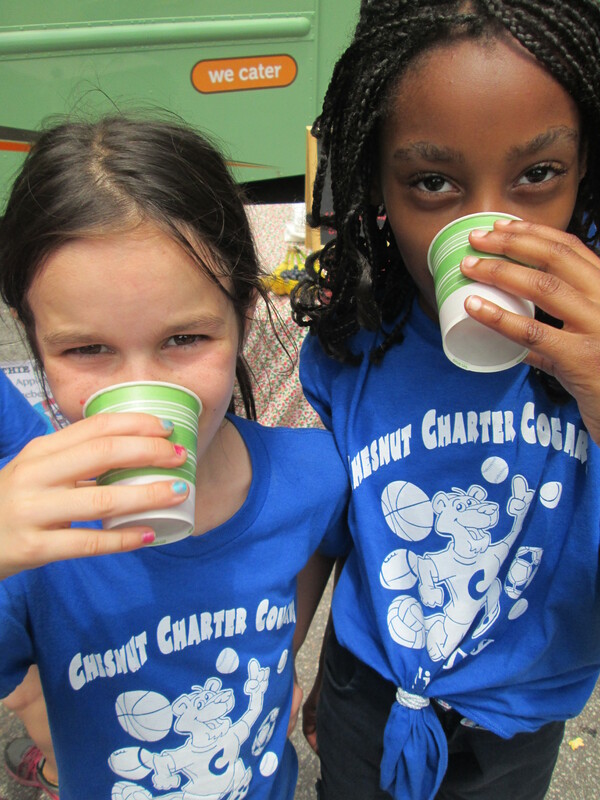 Sadly, the last customers, Ms. Erbesfield’s second graders, missed out on the Field Day smoothies because we ran short. When they came out to the Chesnut Garden the following week, we made sure to bring them generous helpings of mango strawberry banana smoothie to make it up to them. Students, teachers, administrators, families and community members who work together to learn how to protect the well-being of the Earth and ourselves. Please subscribe to our blog (below) and contact us with questions, suggestions and funding offers at ecology@chesnutelementary.com.